I am being beaten to a pulp by my toddler! with Post-its (because then it's sure to work, right?). 3 Copy other people who have nicer-looking visible stashes than mine i.e. any quilter featured on Sew Mama Sew. The prevailing method of organization, it seems, is to sort by color. So shall it be! Color isn't working for me. Maybe it works for a quilting stash, in which everything is cotton. My stash has duckcloth, georgette, vintage lace, nylon packcloth, atheletic mesh, fleece, knits, felt, corduroy, ikat, batik, chiffon, tafetta, satin, velour, interfacing and old twill bedsheets. And that's not counting the bizarre assortment from my teenagehood that I shipped from Singapore when we moved here. Shelf 3 for cotton (the sort I buy on impulse during Fabric.com sales against my better judgement but never sew anything with). Ding ding ding! on to Round 2! I have my stash of small pieces that I use for appliques by color and it works for me. I do separate knits from cotton but with my cotton I also have corduroy. For my other fabrics I have some on bolts and others folded. I'm use two bookcase and a walk in closet with shelving to store my fabrics. In the closet I also have a hanging sweater organizer that I picked up on clearance at Belk. It works nicely for what I call fun fabrics like faux fur, felt fur, minky etc. Now that the Christmas rush is over, I need to refold some of my stash. 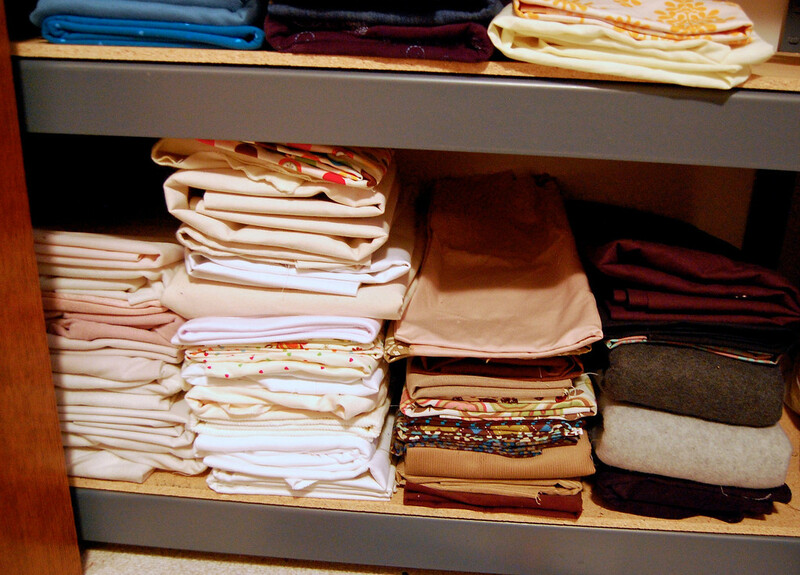 I organize my fabric according to fabric type. One tub for flannel, one for cotton/poly, one for "special occasion" fabrics, and so on. My big organizational problem is notions. I've been using shoebox-sized plastic boxes for those, but I'm in and out of the notion boxes much more than the fabric tubs, and so everything winds up in an insane mess. And it doesn't help when my daughters start poking around in my ribbon and lace! I'm waiting for your solution, see if it might work for me... I tried folding it and putting it on shelves, but I don't know how, it always ends up looking like your first picture. Pff... Question: what would you do before moving ? Sorting your fabric first, or wait until the big day ? I hope you ate at least 1000 chocolates for that bit so far. I divided my stash into cloth for myself/family, and cloth for etsy. Then I further sorted the family cloth into types (knit, bottomweight, plaid, children). The etsy cloth is the stuff that is jammed into the closet. I usually sew the first thing that comes out easily since I figure sooner or later I will sew all of it. I'm not really buying fabric right now. I think you're right that visibility is key (and chocolate). I'm off now to make nutella and hot chocolate. Again, not joking. I had a "shelf 3",too becauce I never can say "NO!" - especially on sales or so. Something like hunt and gather. Wow! I just found this blog and I love it! I am just about to get my own sewing space and I totally get your dilemma. I sew clothes (for and little people), craft, repurpose and quilt - how's a girl to organise her stuff? Seriously I so hear this post. and I look forward to reading more. I just finished sorting and reorganizing my studio. What a mess. It took a week, several hours a day. Here's some encouragement. 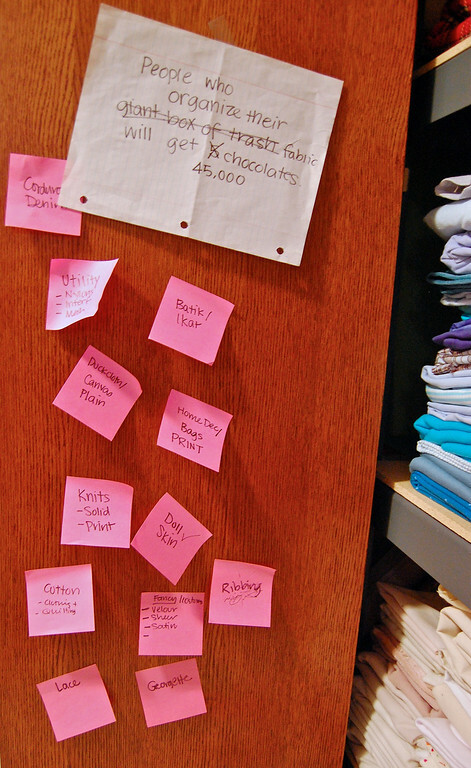 By sorting and organizing you will find things you didn't know you had and now can use. Also if you organize it so that you can see it you can use it. I do organize my fabric by color, type and use. 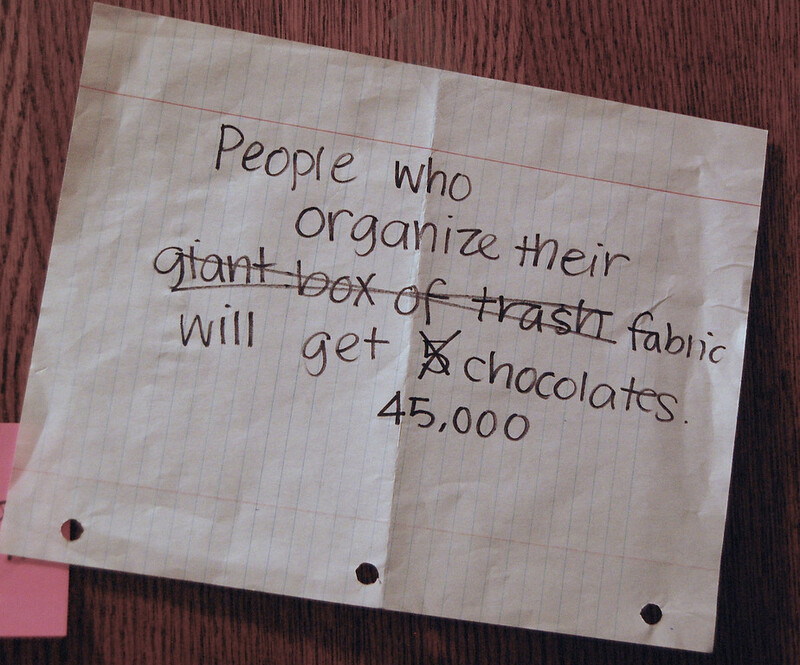 Of course, chocolate is the ultimate motivator. thank you for all the suggestions on organizing stashes. It's really good to know that other people have been there (and some are still). It's also good to know what's worked for you - it sounds like everyone's is different and we just have to find what will work for it. Cecile: if I were moving, I'd just dump everything in a big box, if it all fits, and label it "Fabric". Or if it's too much to fit in one, I'd separate it into boxes according to its categories. 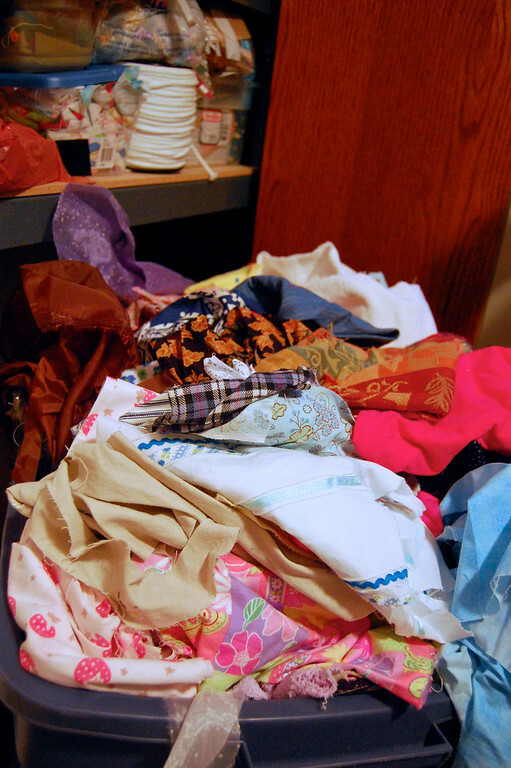 When I moved here 5 years ago (and by "move" I mean immigrated and shipped all my life possessions, except my treadle sewing machine, bah), I threw everything fabric-ish into one large cardboard box. This is the same cardboard box (except it went straight into a rubbermaid tub) that I am now sorting for the first time, 5 years later. Bad, huh? Margo: I only just realized the repercussions of an etsy shop last night when I had to sort through folders of records, documents etc related to my etsy stuff. Thought of your comment and reflected that, just two years ago, my life was simpler when I just sewed for fun and didn't have to keep expenses or calculate how much yardage of fabric A went towards an etsy item and how much was hobby-related. Ugh. I relate. 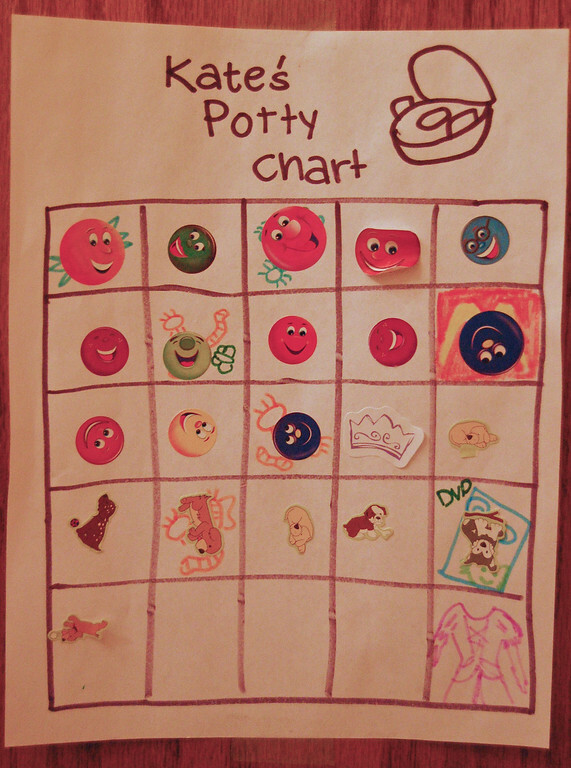 MaryAnne: good for you using teenage years fabric! That was on your blog, wasn't it? At least one of us (i.e. not me) has good enough taste at a young age for her adult persona to still want to be associated with! Well, am off to tackle Round 3 now - the notions/high density foam/nylon packcloth/rolls of drafting paper/interfacing bolts. This round makes Round 2 look easy. Must clean out old nutella IV drip and fill with 90% cocoa content chocolate. Just finished squeezing neat piles of fabric onto my shelves yesterday. Apparently I'll need to get sewing if I want to put any more fabric away. 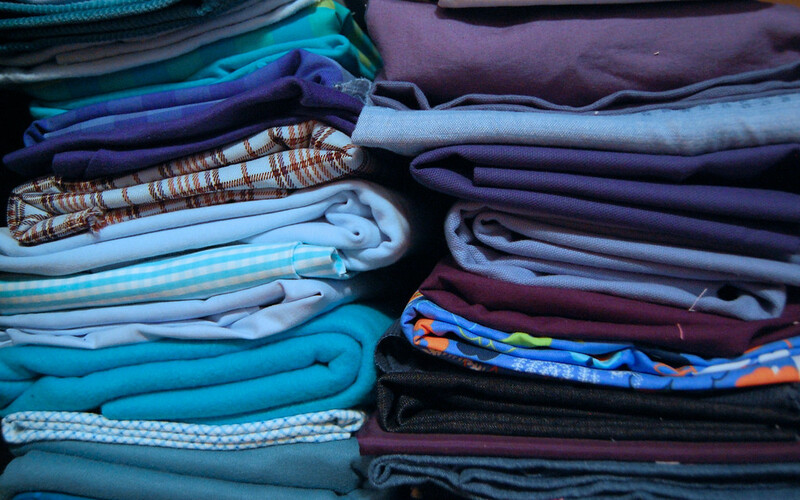 Still, I have a system: a yard and over gets sorted into cottons, shirting, heavy stuff and not-so heavy stuff. Then it gets divided into colour, kids stuff, other theme. Then there's a basket of half yards and a few stacks of fat quarters etc.